Entering Tuesday’s game, the Red Sox lead the Orioles by 12 games. With John Smoltz on the mound opposing Rich Hill, the challenge appeared to resemble little more than a lay-up for the best team in the American League. Early on, that was exactly the case. Julio Lugo singled to open the game, and after stealing second, jogged home thanks to a Kevin Youkilis homerun. David Ortiz would add a double and Jason Varitek would walk before the inning ended on a groundout. The Sox would add another two runs in the second, and entering the third lead 4-0 with Smoltz facing one more than the minimum amount. A Felix Pie triple in the third pushed the first Oriole run across, but Boston wasted little time responding, Jacoby Ellsbury homered on the third pitch of the 4th and scored the first of five Boston runs. Smoltz took a 9-1 lead and pitched a perfect inning before giving way to Justin Masterson who promptly retired six straight batters. 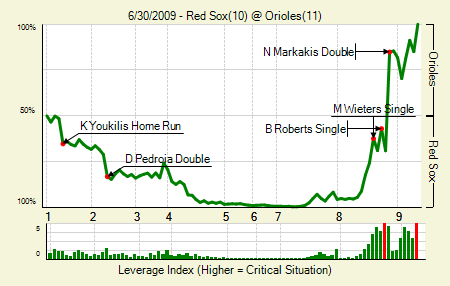 When the Orioles came to bat in the 7th, Boston had added another run, making it 10-1, and placing the Orioles win expectancy at a firm 1%. Aubrey Huff singled on the first pitch, then Nolan Reimold shot one through the right side of the infield. With two on and nobody out, Luke Scott hit a deep fly ball to right field, plating Huff and placing two on in scoring position. Oscar Salazar checked in for Melvin Mora, and two pitches later, hammer a ball to left field that cleared the fences. Just like that, the score was 5-10, and Matt Wieters was stepping to that plate. After getting ahead 0-1, Masterson yielded yet another hit and was quickly pulled for Manny Delcarmen. Robert Andino and Brian Roberts quickly grounded out to second base, giving Baltimore dim hope for scoring another run, yet Pie once again proved timely, and scored Andino on a liner up the middle. 6-10 Baltimore, with Hideki Okajima called upon to finish the inning. In order to preserve any chance of an unlikely comeback, Mark Hendrickson would have to hold the Sox under command with the heart of the lineup due up. Jason Bay grounded out easy enough, and a walk was almost erased by a George Kottaras force play. Then Baldelli and Ellsbury singled on back-to-back plays, and it was up to that guy, Felix Pie, to throw the runner out at home. Making Pie’s play all the more improbable is that he was filling in for the injured Adam Jones and that he actually finished with a negative WPA. Go figure. With Okajima remaining in the game, the Orioles pounced. Reimold singled, Scott doubled, Salazar reached on an infield single, Wieters singled, Wigginton would hit a sac fly, and then Roberts would single, chasing Takashi Saito after only two batters. Jonathan Papelbon entered with one out, a one run lead, and a 70% win expectancy, he made quick work of Pie, and the outnumbered Baltimore fans were no doubt dubious about their already ridiculous comeback. Nick Markakis stepped to the plate and on the very first pitch doubled to deep left, scoring two runs and giving Baltimore the lead against the best team in baseball. The O’s would fail to add any insurance, and the game would be left in the hands of George Sherrill. A Jeff Bailey singled opened the 9th, but a strikeout and fly out seemed to kill any chance of another comeback on this night. Sherrill plunked Kevin Youkilis, then struck out Jason Bay on four pitches, ending the game, and capping a fine Baltimore victory. We hoped you liked reading Game of the Week: 6/29-7/5 by R.J. Anderson! Let it be told, the finest game of Oriole baseball in a decade or more.